A bill sponsored and supported by various trade associations and organized labor including the California Trucking Association (CTA) and the California Teamsters Union will give California commercial driver’s license (CDL) holders a minor break when it comes to keeping points off their licenses. The legislation, AB 1888 is authored by freshman Assemblyman Mike Gatto (D-LA/Burbank) and Senator Ted Lieu (D-West LA). The bill is now awaiting Gov. Brown’s signature and will allow California commercial drivers to avoid accumulating points from certain violations in their private vehicle by attending traffic school. Once signed by the Governor, beginning January 1, 2013, commercial drivers would be able to take advantage of a traffic school option for certain violations they receive when driving their personal vehicles and avoid accumulating points against their driving privileges for suspension purposes. Unlike current California law which allows the “masking” of violations in lieu of traffic school for everyone but a CDL holder, AB 1888 would not hold “confidential” convictions of commercial drivers for violations in their private vehicle thus avoiding conflict with federal law that prohibits the “masking” of convictions. Insurance companies would still be able to see your conviction for underwriting purposes. While this legislation may be welcome news for some truckers, beware that certain convictions for violations accumulated in your personal vehicle can still lead to disqualification of your CDL under federal regulations. Also, the traffic school option does not apply to out-of-state CDL holders according to California Vehicle Code 1808.7(b)(2). Current federal law prohibits states from “masking” convictions of CDL holders for violations of traffic laws. While CDL’s are issued by states, the regulations governing state CDL programs are administered by the Federal Motor Carrier Safety Administration (FMCSA). FMCSA has stated in a letter to supporters of AB 1888 that California can withhold demerit points for violations as long as the related conviction still shows up in a CDL holders driving record. Speeding excessively, involving and speed of 15 mph or more above posted limit. Driving recklessly, as defined by state or local law. Following vehicle ahead too closely. And of course all major violations relating to alcohol and drugs. The minimum suspensions under federal regulation for the above violations are 60 days for a second offense in 3 years and 120 days for a third or subsequent conviction in your personal vehicle. There are numerous violations contained in the Federal Motor Carrier Safety Regulations (FMCSR’s) that can lead to disqualification of your CDL – even for violations in your personal vehicle. Further information on disqualifying offenses for CDL holders (including lifetime disqualifications) can be found in the FMCSR’s under §383.51. Court Reaffirms Exemption of Drivers from Overtime Law. Idaho Truckers Can Now Operate at 129,000 lbs. 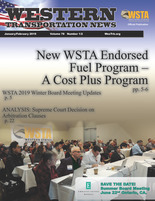 Western Transportation News (ISSN 2380-4009) 2001-2015 Copyright ©, All Rights Reserved.